Provides optimum imaging and trouble-free performance on all color laser printers and color copiers. 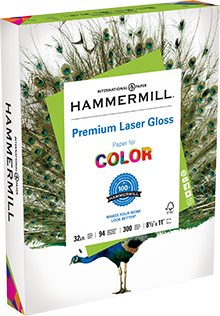 This gloss coated sheet allows you to create slick, high quality documents that look like professionally-printed pieces. This coated product is not suitable for inkjet printers. We guarantee that you will not experience more than one jam in 10,000 sheets on high-speed digital equipment, or we’ll replace the paper or offer a refund up to the total purchase price. This paper is Made in the USA, FSC® Certified, contributes to satisfying credit MR1 under LEED, and is 100% Acid-Free. Gloss finish produces impressive photo-quality color documents. Slick coating provides professional print-like quality. 94 brightness for sharp, clear text, and vivid colors.